Photo 1. A pine log sawed at Palomar College. Most of the boards in this image are plainsawn (slab-cut) into tangential sections. A cut through the center so the rings are at right angles to the face of the board is termed a radial cut or radial section. In a radial section the annual rings are parallel. The center boards in this log are close to radial sections because the rings are nearly at right angles to the face of the boards. In quartersawn boards, the log is sawed into quarters and then the boards are cut from each quarter so that the rings are nearly at right angles to the face of the board (see next image). All quartersawn lumber is radially cut, but not all radially-cut lumber is quartersawn. Radial cuts can be made directly through the center of the log, without dividing the log into quarters. A. Tangential sections are made perpendicular to the rays and tangential to the annual rings (red circles) and face of the log. This plane is also called slab-cut or plane-sawed (plainsawn) lumber. The annual rings appear in irregular, wavy patterns (See Photo 2 & Photo 3 Below). This is the plane in which most plywood and lumber is cut at the saw mill. Photo 2. Tangential plane of Douglas fir (Pseudotsuga menziesii) plywood showing the attractive, wavy pattern of the annual rings. Also see the oak block in Photo 5 below. Photo 3. Stained ash cabinet showing tangential plane of wood. 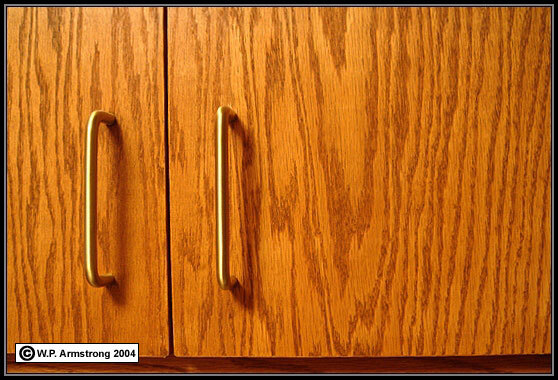 This is the most common cut on cabinet doors and furniture. B. Radial sections are made along the rays or radius of the log, at right angles to the annual rings. [Note that the radial cuts are mostly at right angles to the red annual rings.] This plane is also called quarter-sawed (quartersawn) lumber because the logs are actually cut into quarters. The rings appear like closely-spaced, parallel bands (See Photo 4 Below). Since relatively few, large, perfect, quarter-sawed boards can be cut from a log, they are more expensive. Because the dense, dark summer bands (annual rings) are closely spaced, this plane is also more wear-resistant. Photo 4. Radial plane of ponderosa pine (Pinus ponderosa) showing the closely-spaced, parallel annual rings. This is also called a quarter-sawed (quarersawn) board. It is more resistant to wear because the dense (dark) summer bands are very close together. Photo 5. An oak log sawed at Palomar College. Most of the boards in this image are plainsawn (slab-cut) into tangential sections. A cut through the center so the rings are at right angles to the face of the board is termed a radial cut or radial section. In a radial section the annual rings are parallel. The center boards in this log are close to radial sections because the rings are nearly at right angles to the face of the boards. In quartersawn boards, the log is sawed into quarters and then the boards are cut from each quarter so that the rings are nearly at right angles to the face of the board. 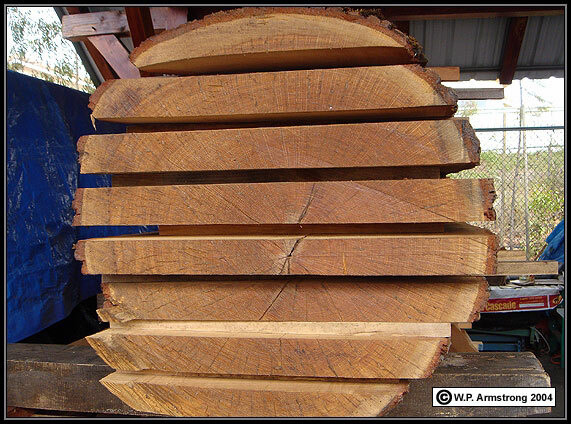 All quartersawn lumber is radially cut, but not all radially-cut lumber is quartersawn. 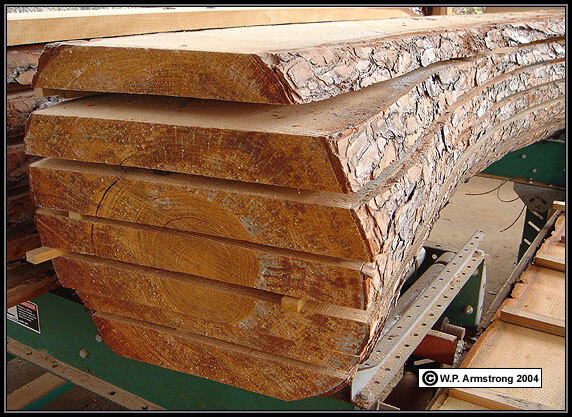 Radial cuts can be made directly through the center of the log, without dividing the log into quarters. Photo 6. 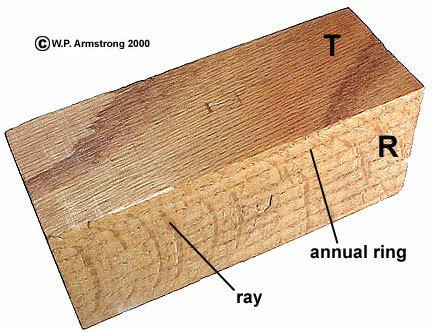 A block of oak wood showing the tangential plane (T) and the radial plane (R). The parallel lines on the radial side are annual rings. The blotches of cells at right angles to the annual rings are rays (ribbonlike aggregations of cells extending radially through the xylem tissue).